Sebacic Acid Market size was accounted to be above USD 300 million in 2016 and consumption might surpass 100 kilo tons by 2024. Rising consumer awareness towards personal hygiene and healthcare in India and China increases the demand for household products such as cleaning brushes and toothbrush, driving sebacic acid market size. 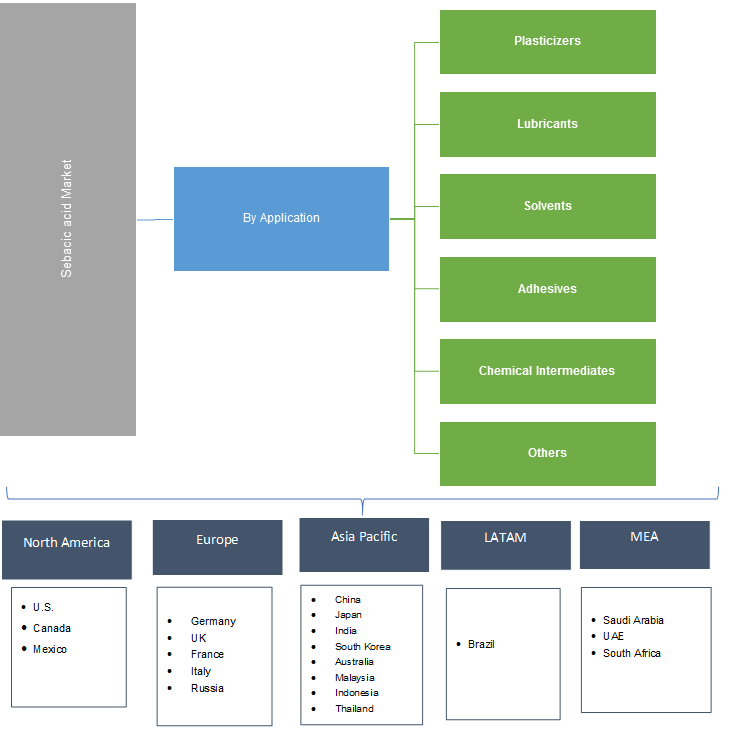 Strong application scope in automotive, pharmaceuticals, textiles, aerospace and household industries is expected to drive global product market size. It is widely used as monomer for manufacturing textiles, cosmetics, plasticizers, lubricants, candles and hydraulic fluids. Favorable government regulations and policies due to its non-hazardous property should stimulate product demand. Sebacic acid is extensively used in manufacturing PVC coatings which can perform under wide range of temperature and finds strong application scope in automotive and aerospace industries. In 2016, revenues generated through global automotive sales accounted to be over USD 88 million and anticipated to grow further during forecast time period driving product demand. Increase in production of automobiles in India and China is expected to stimulate regional product demand. It can derive di(sodium) sebacate which is classified as corrosion inhibitor in lubricant industry and is used as coolant fluid for automotive, aircrafts and truck engines. Sebacate diesters are also derived from sebacic acid which is used in manufacturing complex greases and lubricants for turbines and industrial hydraulics and compressor system. Global lubricants market was estimated to size over USD 150 billion in 2016 and projected to grow at a rate of about 5%. Adoption of bio-based lubricants reduces harmful environmental effects thereby driving industry growth. Increasing automotive sector for utilizing bio-based and synthetic lubricants along with to enhance fuel efficiency is likely to favor product demand. Positive application outlook in automobile, construction, and packaging industry should drive adhesives and sealants market size. Growing vehicle sales accompanied with strict regulations to reduce vehicle weight may boost industry growth. In 2016, automotive production was about 90 million units and may surpass 120 million units by 2024. Rising demand for adhesives mainly in China and India may drive sebacic acid in the region. Threat for substitute from adipic acid, azelaic acid and corfree may hinder sebacic acid industry growth, however comparatively low price from its substitute products should augment market demand. Lower production cost due to cheap availability of raw materials in countries like India and China should positively impact market demand in the future. Growing demand for corrosion inhibitors and anti-freezing coolants in various end-use industries should propel industry growth. Castor oil is the key feedstock used for its production process. Fluctuating castor seed costs may hinder industry profitability and affect sebacic acid market price trend. Shift in trends towards manufacturing bio-based polymers from environment friendly and renewable sources like castor oil is beneficial compared to petroleum derived polymers. These polymers are used in manufacturing bio-engineered plastics which finds extensive use in automotive, construction, electronics and consumer goods industry fueling industry growth. Sebacic acid market size from plasticizer applications is poised to surpass USD 200 million by 2024. Its application in manufacturing polyamides provides better flexibility, hydrophobicity ductility and lower melting temperature compared to adipic acid and close to that of azelaic acid. Other types of plastics using the product are copolyimide, copolyesters, alkyd resin, polyols and polyesters driving global product demand. Sebacic acid market size from solvent applications should witness over 3.5% gains by 2024 owing to extensive use in applications for cosmetic industry. Derivatives like diisopropyl sebacate (DIS), diethyl sebacate (DES) and diethylhexyl sebacate (DOS) are wielded as emollient, hair & skin conditioning and masking agent due to its sun protection factor, pigment dispersibility and anti-whitening perspirant properties. Global cosmetics market size expects to surpass USD 400 billion by 2024 and should positively impact market growth of product. Sebacic acid market size from adhesive applications should witness steady gains. Polyamides for hot melt adhesives synthesized from the product show strong mechanical strength, crystallinity, high glass transition temperature and high adhesion strength. Lower production cost and cheap availability of raw material should drive industry growth. China sebacic market size may witness strong gains and may generate revenue over USD 80 million by end of 2024. This regional growth can be attributed to huge production and export capacity. Presence of numerous end-use manufacturers like cosmetics, pharmaceuticals, textile and automotive industries coupled with cheap labor and raw material availability should drive regional market growth. Europe sebacic acid market size expects to witness steady gains at over 4% during forecast period. This growth in demand can be attributed to rising demand for its derivatives in cosmetic and personal care industry. Consumer inclination towards bio-based products should also catalyze product demand in the region. Germany sebacic acid market is anticipated to surpass USD 40 million at the end of 2024 owing to growth attributed to automotive and chemical industry. Economic stability of the nation coupled with high standard of living for its people should increase demand for end-use products involving use of sebacic acid derivatives and drive regional demand. Global sebacic acid market share is moderately consolidated and some of the industry players operating include Casda Biomaterials, Hengshui Jinghua, Hope Chemical, Shandong Siqiang, and Hokoku Corp.
Industry participants are focused on product innovation and strategic alliances coupled with capacity expansions to enhance competitive advantage which is likely to impact positively on product growth. BASF and Asahi Chemical Industry in Japan developed a new electro oxidation process to produce high purity sebacic acid from adipic acid. Sebacic acid is a white flake or powdered crystal dicarboxylic acid derived from castor oil. It is soluble in ethanol, ether and slightly soluble in water. Other manufacturing process include synthetization from phenols and cresols. Intermediates of the product are also used in aromatics, antiseptics and painting materials.